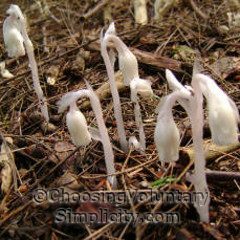 Indian Pipe’s Latin name, (Monotropa uniflora), means “once turned single flower”… it refers to the way each stem holds a single flower that starts out pointed straight down towards the ground and then gradually turns upward as it starts to produce seeds. 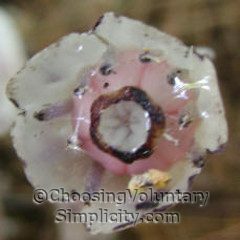 The stems range in height from four to ten inches, and the bell-shaped flowers are about three quarters of an inch long. Some books describe Indian Pipes as being completely white, but this is true only when they first appear. As the plant matures, the flowers become quite colorful, with pink, black, and yellow. Some Indian Pipes have a distinct pinkish color even when they first appear. 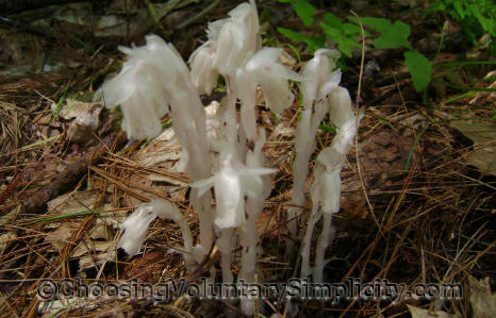 Indian Pipe is frequently mistaken for a fungus because of its lack of color and its tendency to grow in dark, moist places. The plant even feels like a fungus… cold and slightly waxy, almost rubbery. 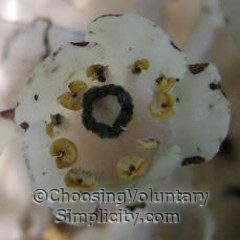 However, it is not a fungus at all but is actually a flowering plant related to rhododendron, dogwood and wintergreen. It grows in northern areas of the United States and in mountainous areas of the American south, often around oak or pine trees where the soil is especially rich in humus. Indian Pipes reproduce by seeds, but supposedly it is almost impossible to propagate the plants. As long as I can remember I have been able to find Indian Pipes in the woods across from our house, and they’re appearing in especially huge numbers this year… probably because this has been such a rainy summer. We’ve been cutting fallen trees in those woods and bringing the long logs back to our house for the last few summers, and then cutting and splitting the logs into firewood in a secluded woodsy area in our back yard. For the first time ever this year we have several clumps of Indian Pipes growing in that area too. Since Indian Pipes thrive at the base of trees, I think we probably have somehow accidentally transported some of their seeds along with the firewood. I have always wished we had Indian Pipes growing on our property too, so finding these here a few days ago was a welcome surprise. We are lucky to have both pink and white Indian Pipes growing here… all are now in the pointing upward stage and are about ready to release their seeds. After the seeds are released, the entire plant will turn black and soon there will be nothing left to show where the Indian Pipes had been. 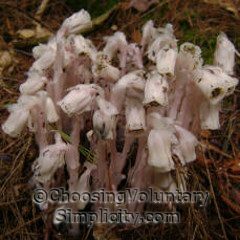 Indian Pipe is a very unusual plant because it contains no chlorophyll and does not rely on sunlight for its survival. Instead it extracts its nutrients from the decaying organic matter in soil. 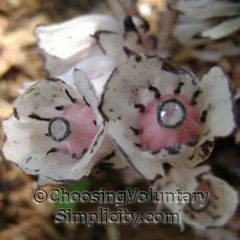 This enables Indian Pipe to live in dark places where other plants could never survive. Some botanists believe that Indian Pipe works in conjunction with soil fungi that help it to extract nutrients from living tree roots, but that idea is not universally accepted. 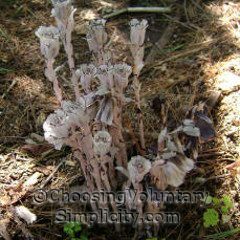 Other common names for Indian Pipe… Ice Plant, Ghost Flower, Corpse Plant. Wow! I have never seen these or heard about them. I always learn something new on your site! I found some of these recently but they were not as pretty as the pinks and yellows, and the heads had not yet opened up. … and now that I’m here I’m seeing all kinds of neat stuff over on the margin! Gosh, I haven’t seen these since I was a tadpole! They look like clay pipes when they come up. I remember a huge clump of them in the mossy woods where us kids used to play, only coming home at dinnertime. I wonder how long these have been on our planet. I guess they wouldn’t leave any fossilized evidence like a fern leaf, would they. Funny how a picture of such a small thing can bring back so many wonderful memories of childhood. Thanks, Shirley.